Jacqueline Banerjee, PhD, Associate Editor, The Victorian Web. Photographs by the author. Click on images to enlarge them. You may use these images without prior permission for any scholarly or educational purpose as long as you (1) credit the photographer and (2) link your document to this URL in a web document or cite it in a print one. The Roman Catholic Church of St Giles, Cheadle, in the West Midlands, was designed by A. W. N. Pugin (1812-1852) and built 1841-46. 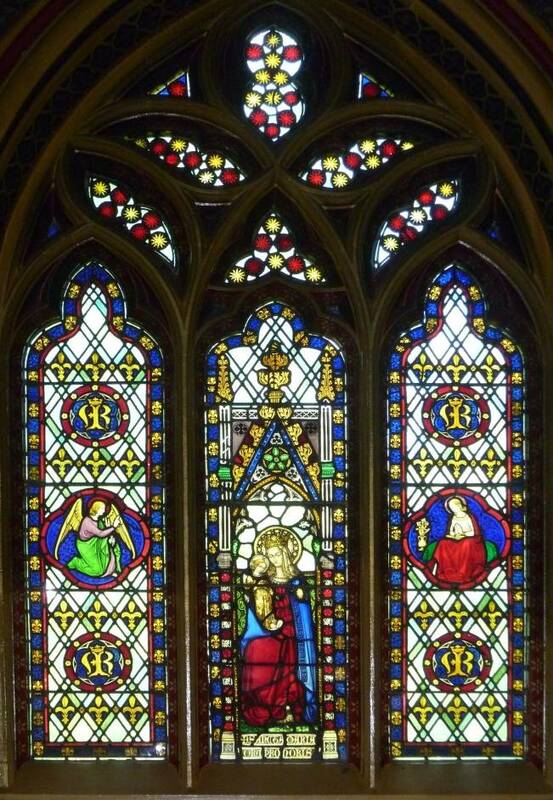 The windows, also designed by Pugin, were part of his whole plan to produce a church that would be "a kind of flagship for English Catholicism" (Fisher 166); his patron the Earl of Shrewsbury saw it too as being "a text-book for all good people" (qtd. in Fisher 214). 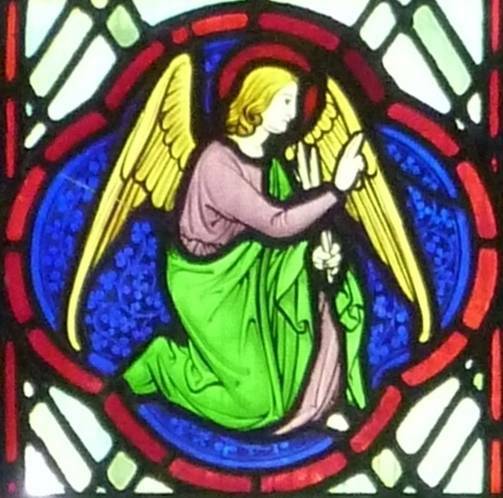 Like so much else in the church, the stained glass windows were an important expression both of its exemplary style and its didactic purpose. They depicted Anglo-Saxon saints, as well as reminding the congregation of the attributes of important Biblical figures, and of Christian virtues and duties. There was plenty of scope for all this. As the listing text informs us, "the south aisle has ... pointed 3-light windows all with different (but authentically Decorated) tracery; the north aisle has similar 2-light windows with a 3 light at the east side only [the one facing the Lady Chapel]." 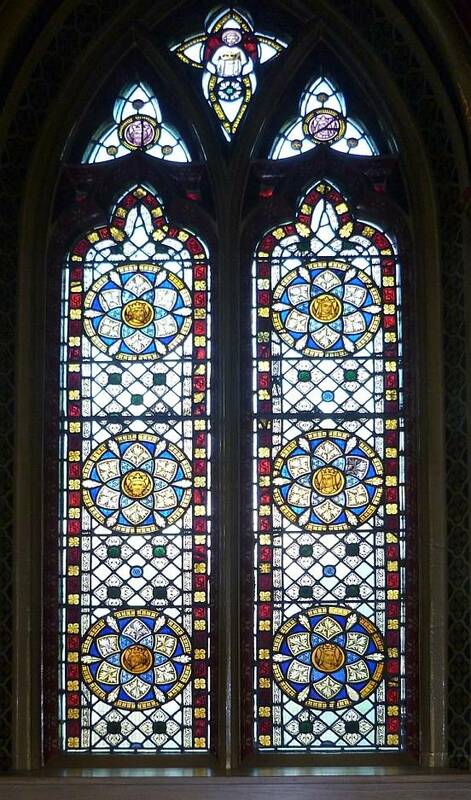 Pugin successfully petitioned Shrewsbury to let him fill the windows on both sides with stained glass. His designs were executed in the workshop of William Wailes in Newcastle upon Tyne. Left: The five-light east window over the High Altar and reredos is a Jesse window depicting the genealogy of Christ, who is shown seated at the centre of the bottom row. King David, holding a harp, is immediately above him. 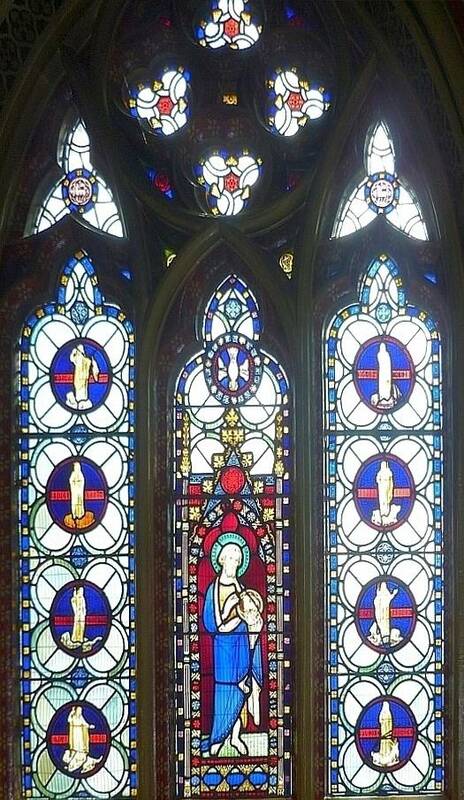 At the very top, in a quatrefoil, is Mary holding the infant Jesus. Right: In the three-light east window of the Blessed Sacrament Chapel, seraphim hold scrolls either side of the crowned, red-mantled Christ. 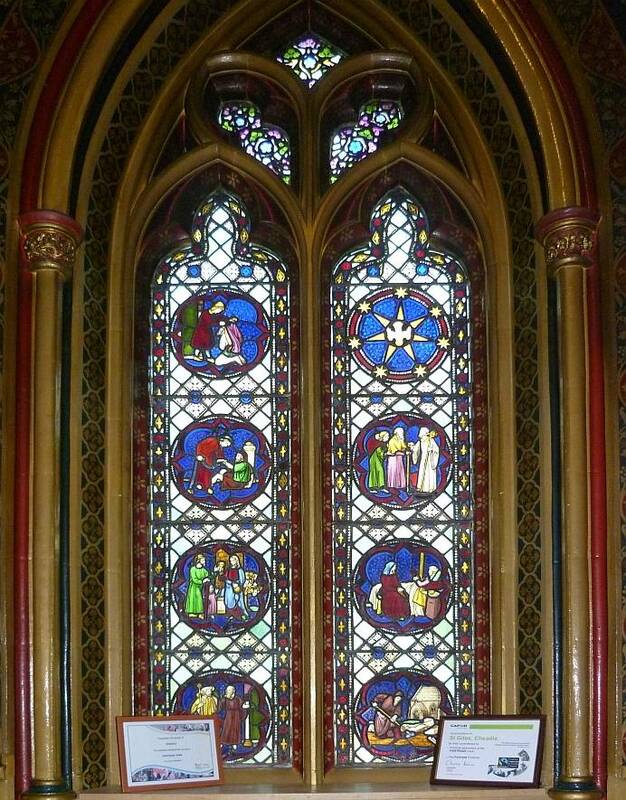 Pugin himself explains that this window shows "an image of our Lord under a high canopy terminating in a cross, with the Evangelists. Beneath the feet of our Lord is this Scripture: — 'Amen, amen, dico vobis, ego sum panis vivus qui de ccelo descendit.' 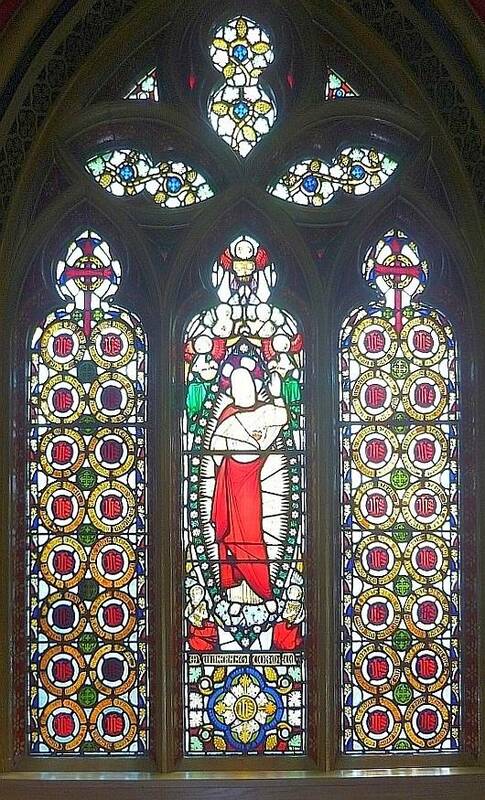 In the side lights a continuous vine forms six quatrefoils, containing cherubim holding labels, with Scriptures in honour of the holy mystery of the blessed Eucharist" (Lord Shrewsbury's New Church, 11). Left to right: (a) Christ, with two rows of roundels either side. 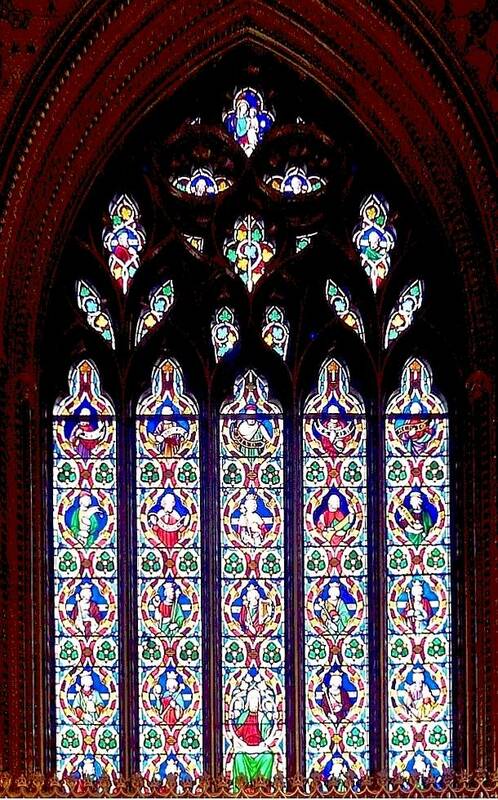 Pugin writes: "The window adjoining the chapel of the Blessed Sacrament contains an image of our Lord in the centre light, pointing to his sacred heart, and surrounded by angels; beneath is this Scripture: — 'Vulnerasti cor meum.' These side lights are filled with monograms of the holy name, encircled with petitions of the Litany of Jesus (Lord Shrewsbury's New Church, 11) (b) St John, St Giles and St Chad. (c) The Virgin Mary with the moon and stars. 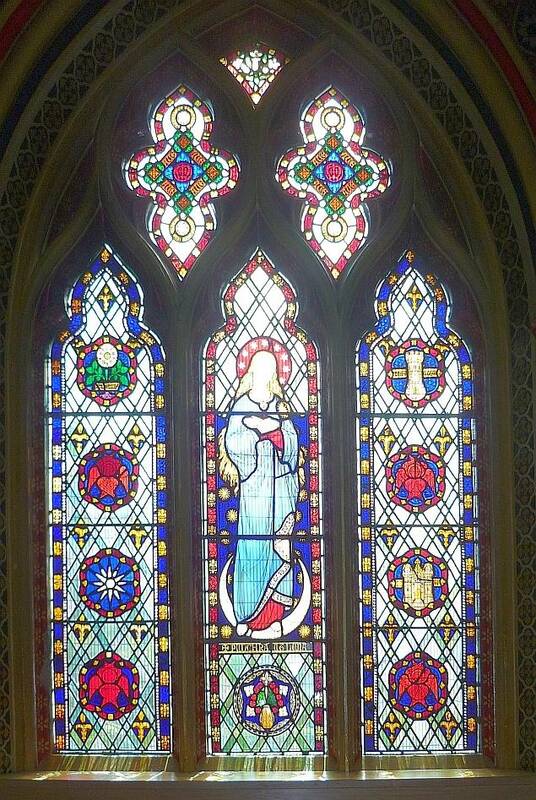 Pugin writes: "In the third window next to the south porch, an image of our Blessed Lady stands on a moon crescent, with this inscription: — 'Pulchra ut Luna.' On either side emblems from the Litany of Loretto on a rich diaper "(Lord Shrewsbury's New Church,10). Left: St John the Baptist. This is the Baptistry window. 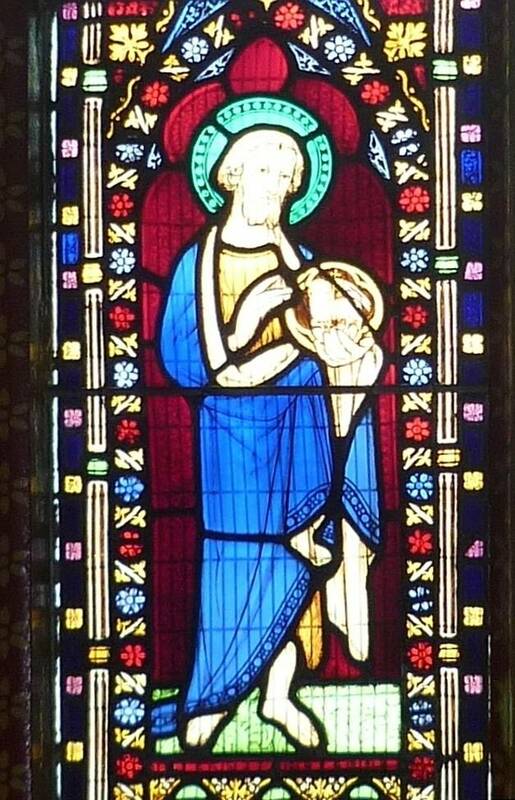 Pugin writes: "The baptistry window is divided into three lights; in the centre, an image of St. John the Baptist, holding the lamb; above, the Holy Spirit descending, surrounded by rays and seven stars. 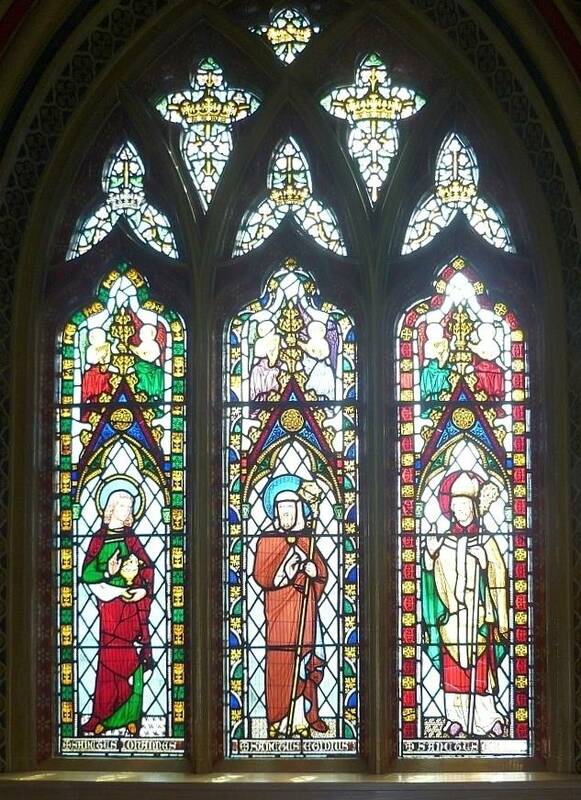 The side lights are divided into eight floriated quatrefoils, containing representations of virtues, such as: — Humility, Charity, Mercy, Modesty, &c, as females, overcoming contrary vices under the form of animals" (Lord Shrewsbury's New Church, 9). Right: Closer view of John the Baptist. (a) The Virgin Mary. 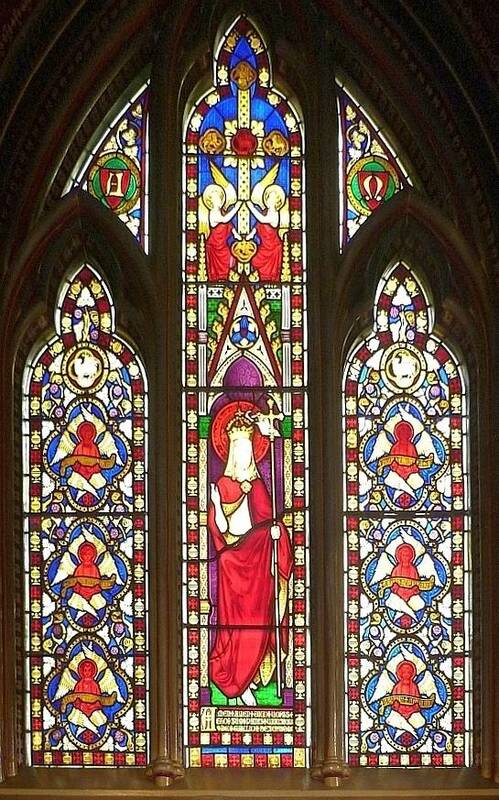 This is the Lady Chapel window. 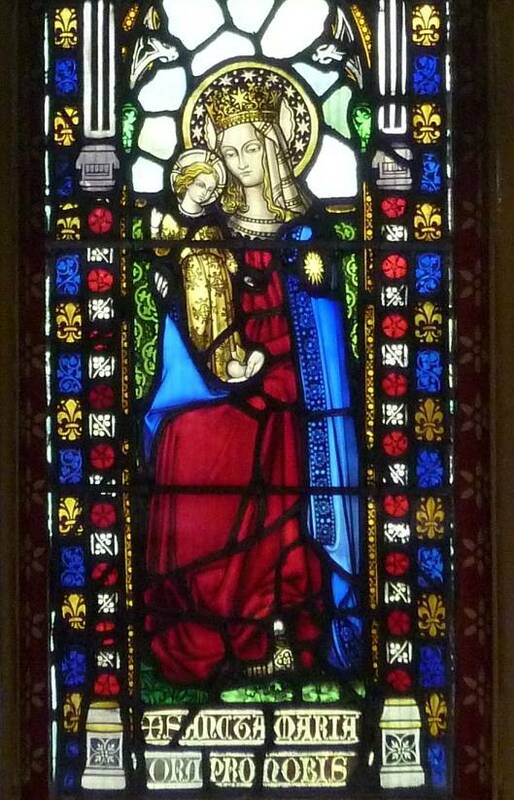 "The window of this chapel contains three lights, in the centre an image of our Blessed Lady with our Lord, and the sides the Annunciation, on a rich diaper of flower-de-luces" (Lord Shrewsbury's New Church, 10) (b) Detail of the Virgin Mary. (c) The Seven Corporal Acts of Mercy: "clothing the naked, visiting prisoners, giving drink to the thirsty, sheltering the homeless, feeding the hungry, visiting the sick and burying the dead" (Fisher 183). 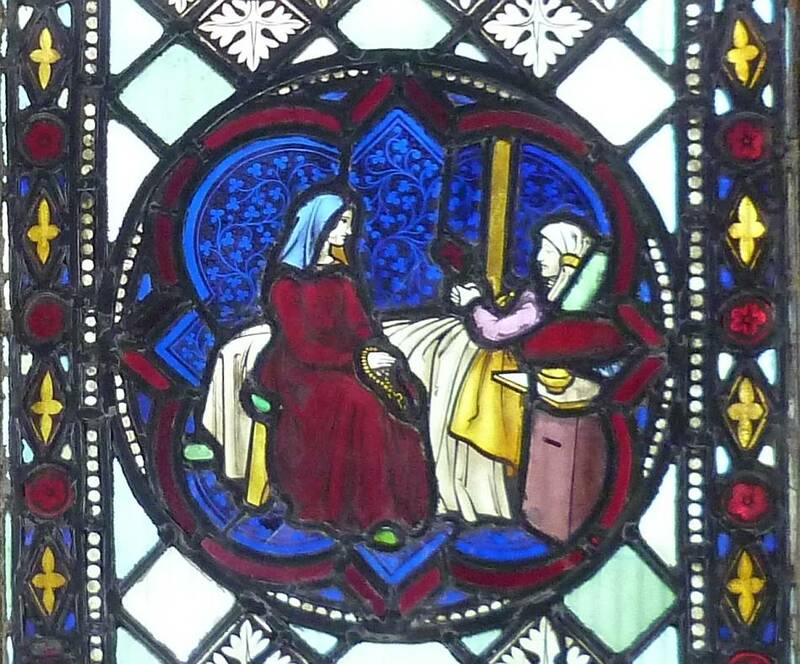 Pugin particularly praised this window when writing to Shrewsbury about the progress of the glass: "I have seen this day the cheadle windows in progress they will be glorious, excellent drawing, the acts of mercy admirable I am certain that your Lordship will be pleased with them, they combine the richness of the old men with true drawing" (Letters II: 170). (a) Detail: "Visiting the Sick." (b) St Peter and St Paul. (c) Anglo-Saxon Saints. Pugin writes: "The westernmost window of the north aisle is filled with a diaper of foliage and sixfoils, with heads of various Saxon saints" (Lord Shrewsbury's New Church, 10). These are (on the left) Edmund, Edward the Martyr and Edward the Confessor; and on the right, Etheldreda, Ethelburga and Mildred. (Shepherd 337). Pugin, A. Welby. Account of the church in Lord Shrewsbury's New Church of St Giles, in Staffordshire: Being a Description of the Edifice.... London: Charles Dolman, 1846. (Free book) Google Books. Web. 28 November 2012. ____. The Collected Letters of A. W. N. Pugin, Vol. 2. 1843-45. Ed. Margaret Belcher. Oxford: Oxford University Press, 2003. Print. "Roman Catholic Church of St Giles." British Listed Buildings. Web. 28 November 2012. Shepherd, Stanley A. 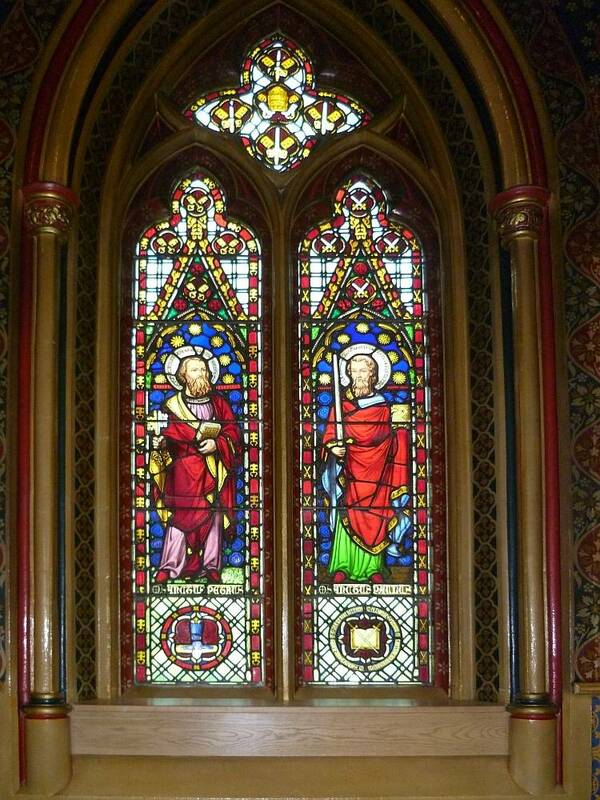 The Stained Glass of A. W. N. Pugin. Reading: Spire Books, 2009 (see especially the Gazetteer, pp. 334-38). Print.